Anyone who knows anything about me (and of course you all do) will know that I adore literature about India. Give me a book like "A Suitable Boy", "Heat and Dust", "City of Joy" and you'll know I'm in my private Heaven. I felt the same with author Dianne Noble's first book Outcast and now her second book A Hundred Hands. You can find my reviews on Amazon or here. Ms Noble's strength lies in her wonderful ability at conveying a sense of place to the reader. 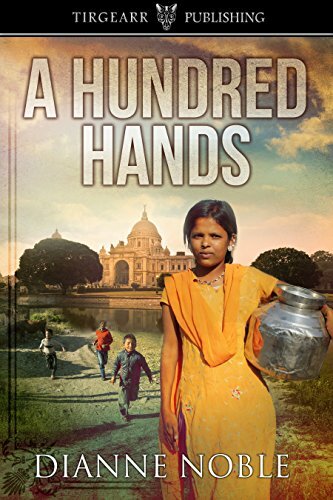 With each of her books I was transported to the slums of Kolkata and lived alongside the poverty stricken. Yet with each book the author transmits hope for the future. She writes as if she loves the places and this filters down to the reader. I was so impressed by her books that I asked if I could interview Dianne on here. And here she is. Sue: Dianne, welcome. I’m so happy that you agreed to be “grilled” – sorry – interviewed on my blog. I have read both your books, Outcast and A Hundred Hands. Both are about the slums of India. Can you tell us something about them from the point of view of the author? Did you have to do much research to write them? Dianne: The slums are gut-wrenching, literally. There is filth underfoot and even in the air. At the end of each day I stood under the shower and the water ran black. Most of the research was from personal experience. I would never presume to write about a country unless I had actually been there – great excuse to continue my travels. However, I needed to consult maps of Kolkata because those available in India are all different to each other! And I needed to confirm train times from Howrah Station to Puri and Bhubaneshwar, for which I used The Man in Seat 61, a great resource which gives all the information but also tempts you down other tracks! Sue: Why do you love India, do you think? (And I believe you do because it comes through in your writing). Dianne: The first time I visited India I was ten years old, flying back to England with my parents and brothers after a long tour in Singapore. Our RAF Hermes plane took almost three days, stopping in several countries to re-fuel, and de-ice the wings. We’d travelled out in a troopship – a whole month and school lessons every day – but the Suez Canal had been closed so here we were in Calcutta, as it was then known. I remember the heat, the highly spiced kofta they gave us for breakfast with a fried egg, which none of us could eat, the hole in the floor toilet we had to squat over while flies buzzed around us, the strange smells and sounds. How could I have known I’d begun a lifelong love affair with India? I believe it’s the heat, the smells and colours, the sheer exoticness (I know, it’s not a word!) that I love about the country. That and the indomitability of people who have absolutely nothing but believe that if they bear their misfortune with fortitude life will be so much better in the next incarnation. Sue: Yes, I like the word "exoticness" - are you sure it doesn't exist? I also agree that the thought that life will be so much better in the next incarnation gives the people such hope. Definitely one of your writing strengths is that you have a wonderful power of observation. How do you cultivate that? Do you wander about with a note-book noting down ideas? Dianne: Ten years ago I volunteered to spend three months teaching English to street children in Kolkata. It proved to be the hardest thing I have ever done. Broken, crumbling buildings sit amid lakes of raw sewage; filthy children encrusted with sores are homeless; families live on a patch of pavement so narrow they take it in turns to lie down. They give birth – and die – there. I almost bottled out, felt my resolve dying daily amid the horrors and hardship, but I started writing a journal and it saved me. Every night, no matter how dirty and exhausted I felt, I recorded one child’s progress with the alphabet, another’s disappearance, how many times I’d been hugged. It was a form of de-briefing but also cathartic. It got me through and these diaries formed the basis for A Hundred Hands and Outcast. Wherever I travel I take a notebook. I take photos too, yes, but in Third World countries it wouldn’t be right to try to photograph people who are at the bottom of the luck ladder so that’s when I jot down everything I see, smell, hear, taste. Sue: Wow - your resilience under hardship is fantastic. Your next book, I believe, will be set in Morocco. Can you tell us something about that? 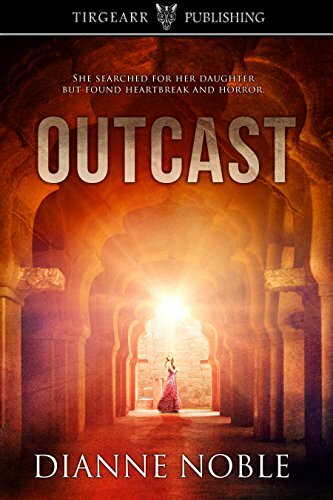 Dianne: Book #3, actually, is set in Egypt and features a forced marriage and people living in poverty in The City of the Dead, a massive necropolis in Cairo. Its title is Oppression and it’s currently with Tirgearr who I hope will publish it early in 2017. The oppression is not only felt by the young Moslem girl who is sent to marry an old man, but for Beth, the protagonist of the story, who lives in fear of her husband. Book #4, my work in progress, tells the story of sisters whose relationship with their mother is fractured. When she asks them to come to Fez, Morocco to help celebrate her 60th. Birthday, they are horrified to discover she has become second wife to a Moroccan, and appalled he’s involved with child labour. Sue: I know I'll love them and look forward to reading them. I think your novels should be published by one of the “Big Five” (or Six, I can never remember). Would you ever consider finding an agent? Dianne: Thank you Sue, that’s a very kind thing to say! I failed miserably in my original search for an agent or publisher. There were 32 rejections before Tirgearr offered me a contract and I am eternally grateful to them for their faith in me. However – never say never! Well done, Tigearr Publishing for spotting real talent then. Good luck, Dianne with your future books (I want first read please!) and thank you for answering my questions.